These last few days have been particularly special. I have seen many things as a tourist but have rarely had the opportunity to go deeper than the exterior. 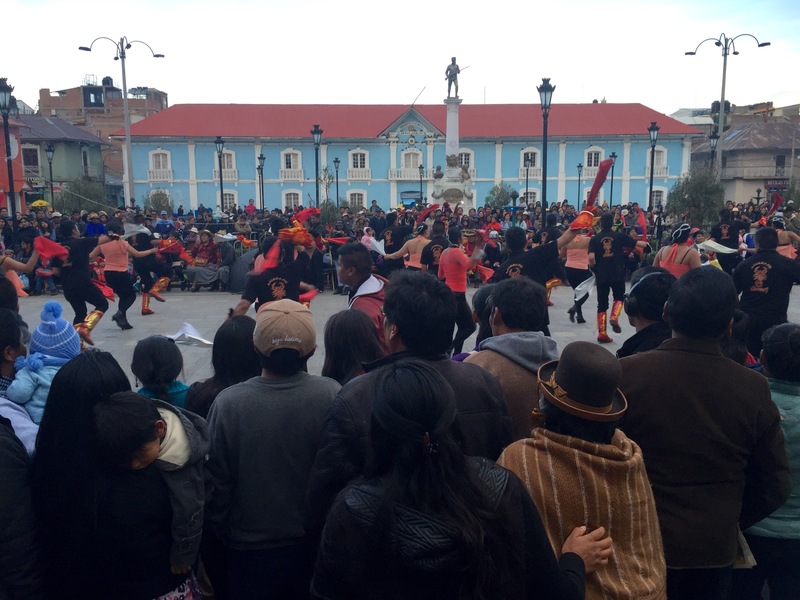 We travelled from La Paz, Bolivia to Puno, Peru relatively easily. I woke up again with more altitude sickness so spent most of the bus journey with my head out the window like a dog trying to get fresh air. 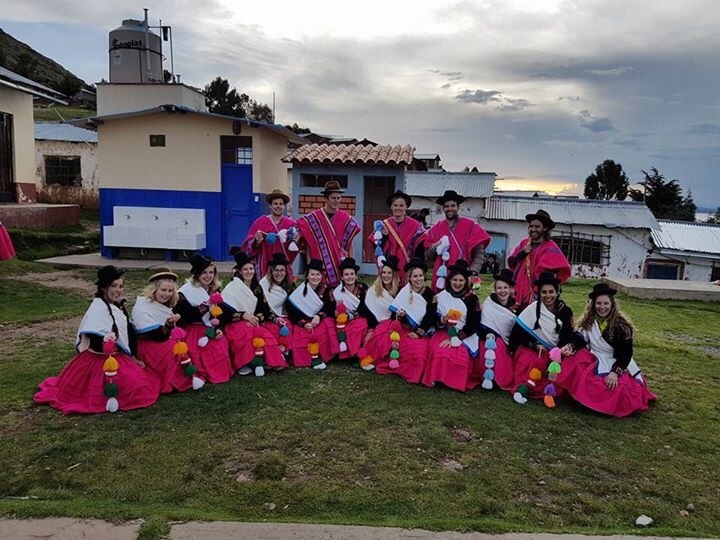 We made a brief stop in Copacabana which is a small town near Lake Titicaca with a population of around 3,000 people. It is a popular holiday destination for the people of La Paz and has also been a religious hub since 1580 when the cathedral was built. We walked across the border about lunchtime. We had to officially leave Bolivia and get an exit stamp and then officially enter Peru and get an entrance stamp. I’m disappointed that my Bolivian stamps in my passport are so faint you can barely see them but Peru has got a great, bold, pink one so it kind of makes up for it! Once we arrived in Puno, we had a brief meeting about the homestay and then walked 2 blocks down to the main square. It was quite a simple main square with a church and some greenery but we were more interested in the music coming from down the road. 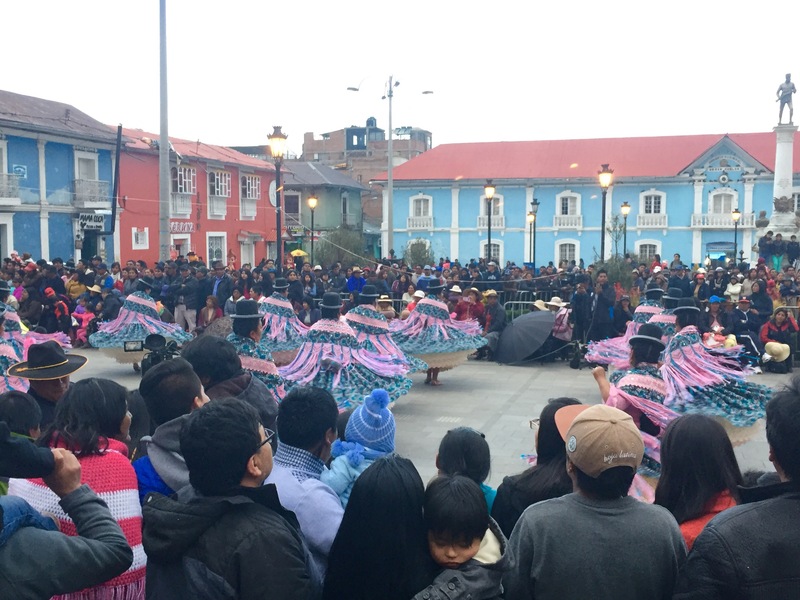 Every year from January 20th til February 6th there is a festival in Puno called Candelaria and we were fortunate enough to be there on a Sunday to see one of the parades. The festival began in the early 20th century, celebrating the Virgin Candelaria. I can see that there is a strong Spanish influence as the parades had a similar style to those that I’ve seen during festivals in Spain. There is a band and then some dancers in groups then another band then more dancers and so on. 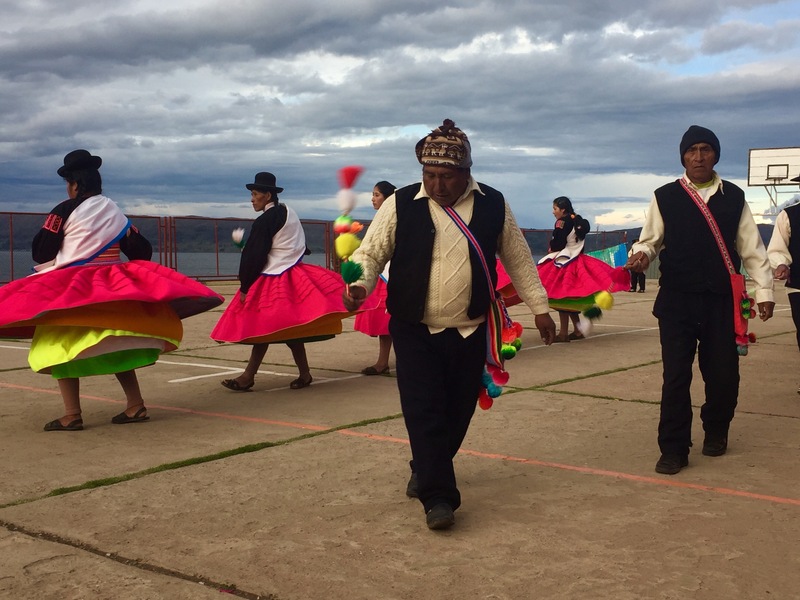 The things that differed were the traditional Peruvian instruments, Peruvian dress and all the dancing groups had a similar style of dancing. The women twirled around in their big skirts and the men did lots of stomping and high kicking. Everyone also has 2 handkerchiefs to wave around. We couldn’t see very well at first so our tour guide, Dennis, led us up the parade route to a better spot. I think it was very obvious that we didn’t know what we were doing as all the locals either side of the road started clapping in time for us!! A very weird experience… I love seeing local festivals as I love the atmosphere and I think it’s great when a culture still keeps its traditions. 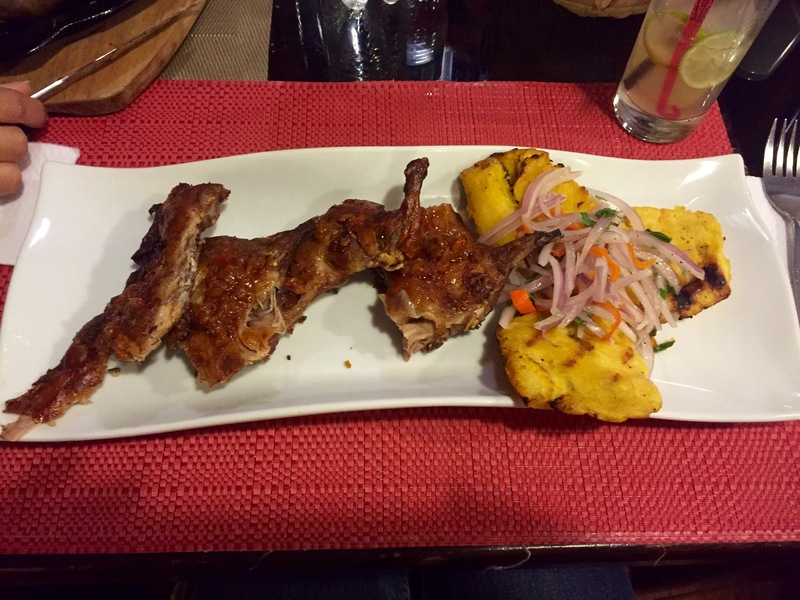 After accidentally joining the parade again to go back the other way, we all went to a restaurant that Dennis recommended called Mojsa where they served a variety of food including the traditional Peruvian dish that I’ve waited all trip to try: Guinea Pig! I was slightly disappointed that it didn’t come as a whole guinea pig on a plate like I’ve seen but it was so tasty!! I had to use my hands to get the meat off the little bones but I washed it all down with a pisco cocktail and I was a very happy girl! 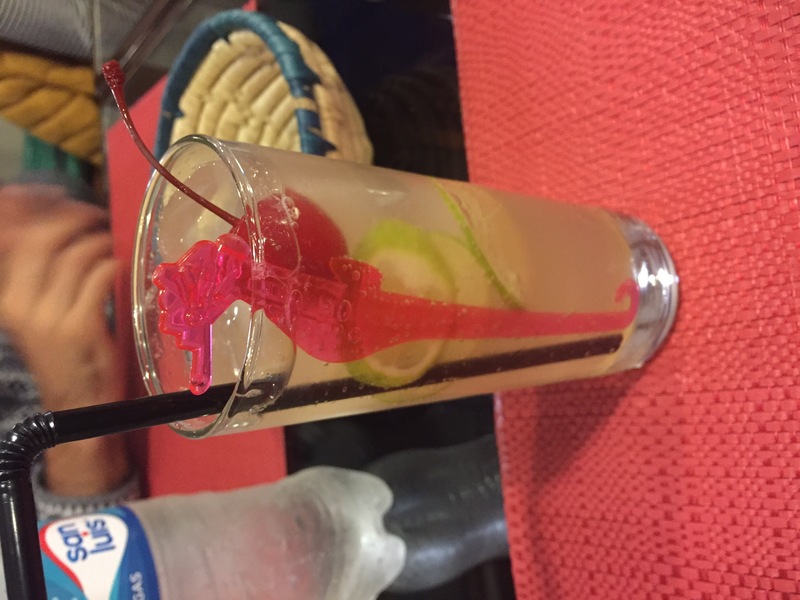 After dinner, half the group went for a drink at a bar down the road and most of us enjoyed a pisco sour. I love any sour cocktail so I was very excited when I saw a whole page of them in the menu! I’m still yet to test if a cocoa sour will help my altitude sickness or if the alcohol with cancel it out… It was nice to spend some time with the new members of the group and get to know them as the rest of us all know each other pretty well after 15 days of constantly seeing each other. The next day was when it all got really exciting! We got some rickshaws from the hotel to the harbour and all went shopping to buy water for us and some food to gift to our homestay families. 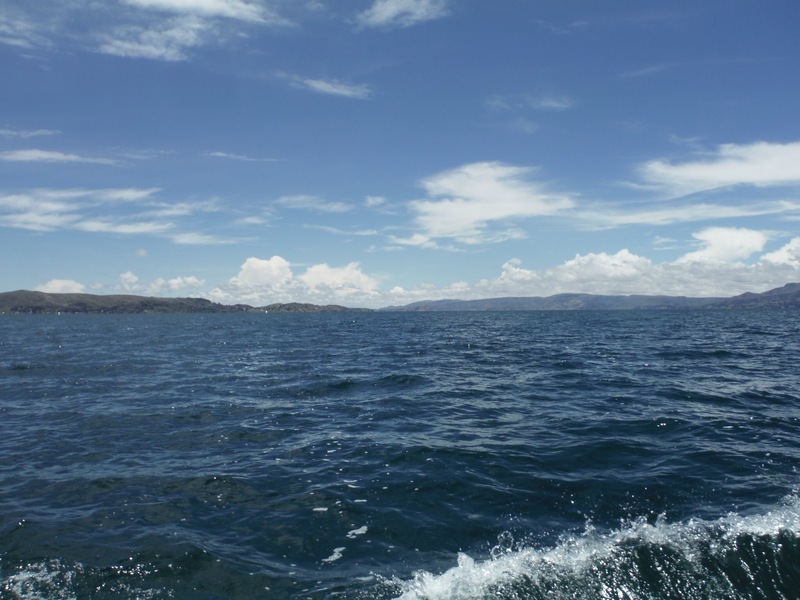 We then got onto a tour boat and headed out into Lake Titicaca. 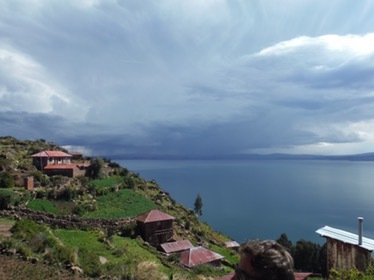 Lake Titicaca or Lago Titikaka is the worlds highest navigational lake and South America’s largest lake. It is an impressive 8400km squared (which is roughly the size of Puerto Rico!) and 284m deep. 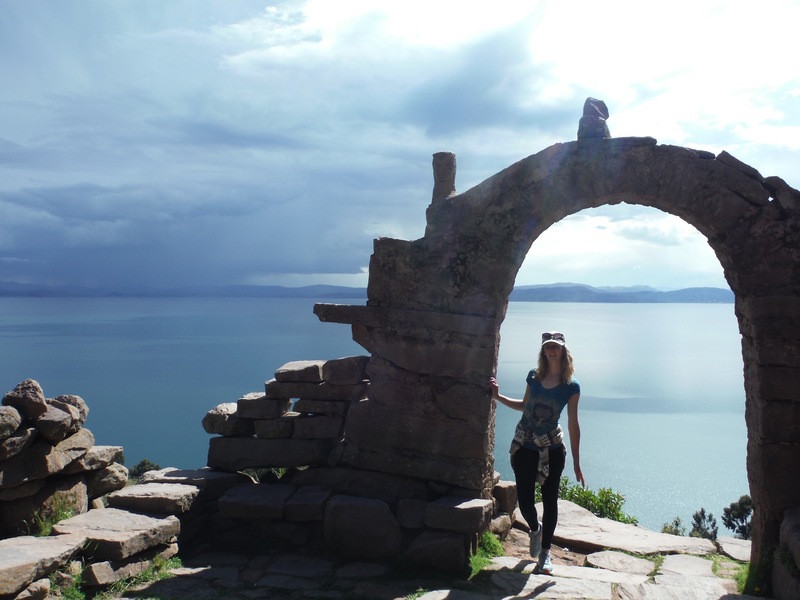 There are Aymara ruins both around and in the lake as there have been civilisations relying on this lake for such a long time. 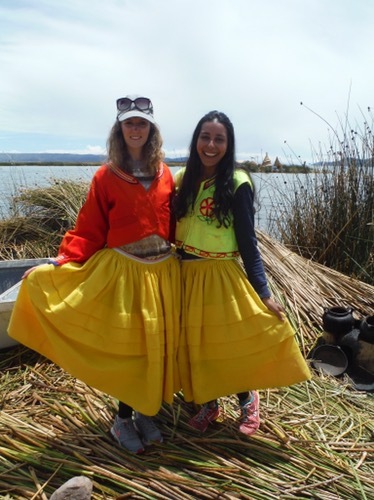 When people first started settling on the lake, Bolivia was a part of Peru. Nowadays, Bolivia owns 40% and Peru owns 60% of the lake. 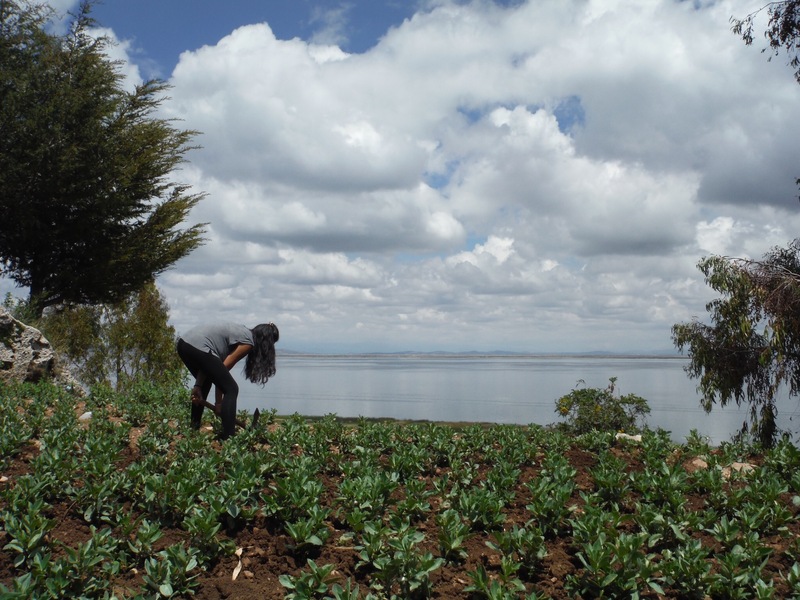 It still has a certain percentage of salt in the water which proves the theory that Lake Titicaca and the Uyuni Salt Flat may have been linked thousands of years ago. 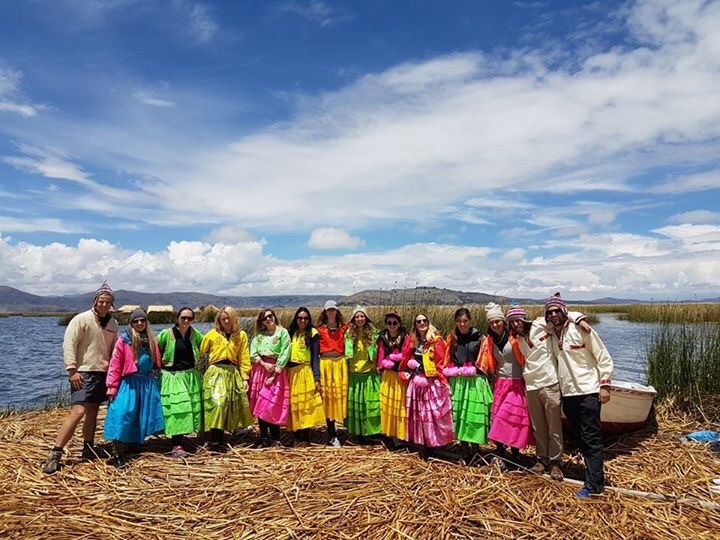 Our first stop was at the tribe of the Uros. 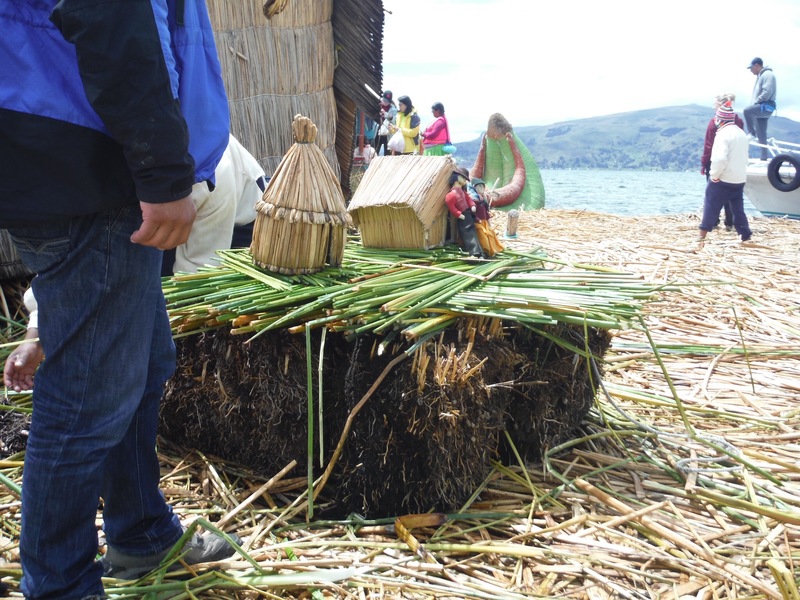 The Uros live on small islands that flit on the lake and are made of reeds. There is about a metre of reed weeds and then a metre or two of cut reeds. 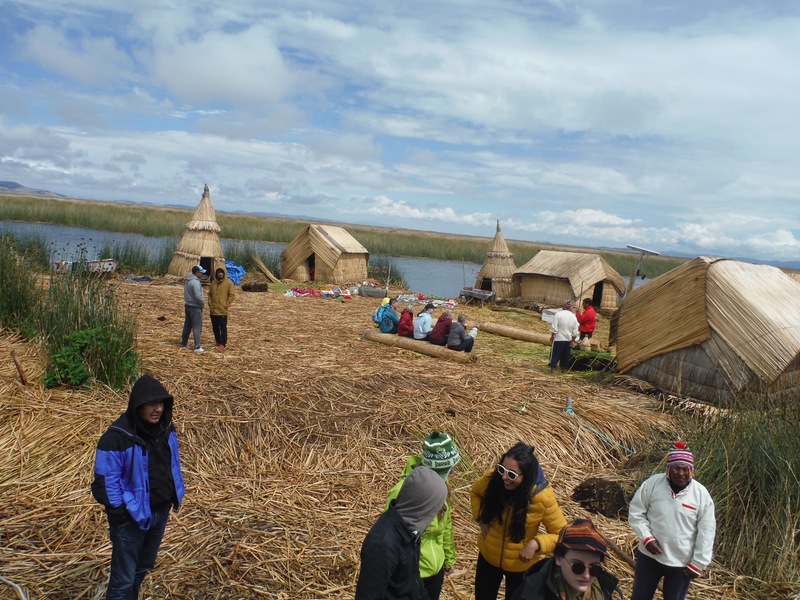 The tribe has a population of around 800 people and they live spread out with one or two families living on each floating island. Obviously the islands do slowly sink so they have to rebuild another one every 30-40 years. 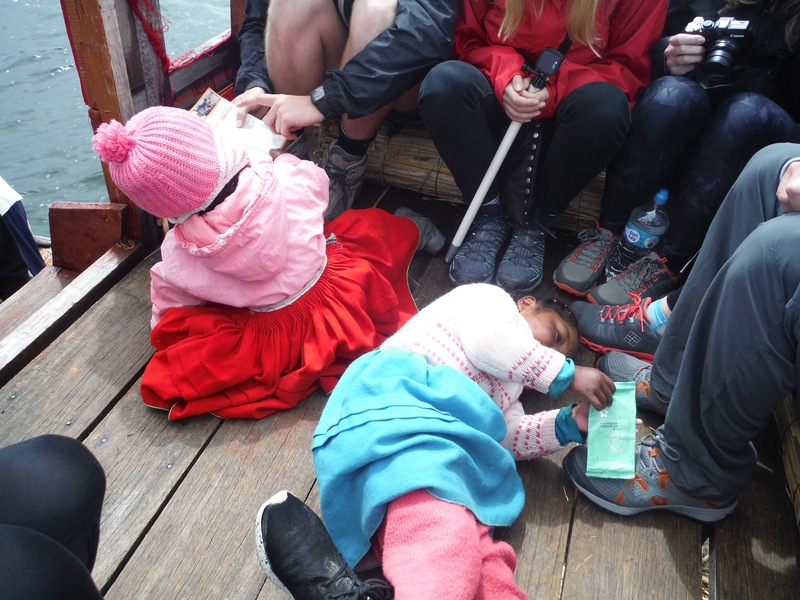 We had a short boat ride where 2 of the young local girls emptied my pack of wet wipes and (snotty) tissues and then we had a talk telling us all about life on the island. A local lady called Benedicta then invited us into her house and dressed us up in their clothes. We all had a great time and bought some of the things they make on the island. Our next stop was for lunch on Isla Taquile where, after a tough 20 minute hike up the hill, we ate quinoa soup and then trout with rice and chips. We were told that most of the locals on these islands eat vegetarian and the fish and meat is saved for the tourists. It was delicious and gave us the energy to hike back down the other side. 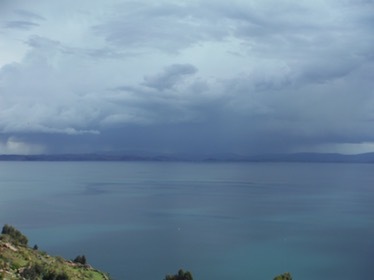 We had some pretty spectacular views on the way down, including an electrical storm the other side of the lake. After a few more hours on the boat, we arrived at our final destination for the day: Lucina Island. We were greeted by a group of local people who then marched us up the the school with a small band. 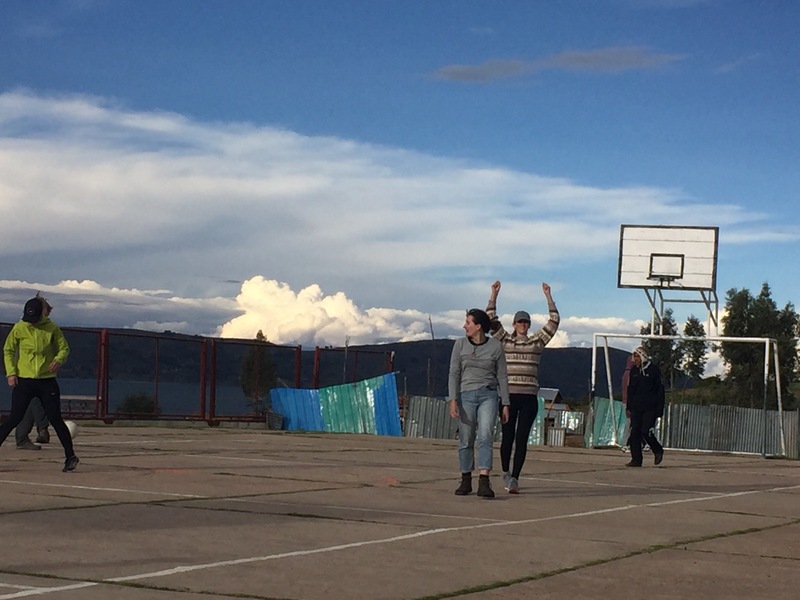 We were welcomed and then played a game of football against the locals. As there were 18 of us plus 2 G Adventures tour guides, we played a tag game and regularly swapped players. It was necessary though as all of us struggled to run around in the altitude! I played twice for about 5 minutes each time and even managed to score a goal! It was a lot of fun and we won 4-3 in the end! After the game we were introduced to our mamas for the first time and ours was called Stephanie. They dressed us up in the local clothes which consisted of THREE skirts, a jacket, a hat and a Pom Pom thing that went around our wrist. We watched as some of the locals danced for us and then we attempted to copy. It was great fun and I’m sure they enjoyed our rubbish attempt! Afterwards, we said goodbye to our group and followed Stephanie to her house. Her guest room was so nice with one double bed and two single beds with an en suite. We got to know her a little bit and gave her our gifts which she was grateful for. 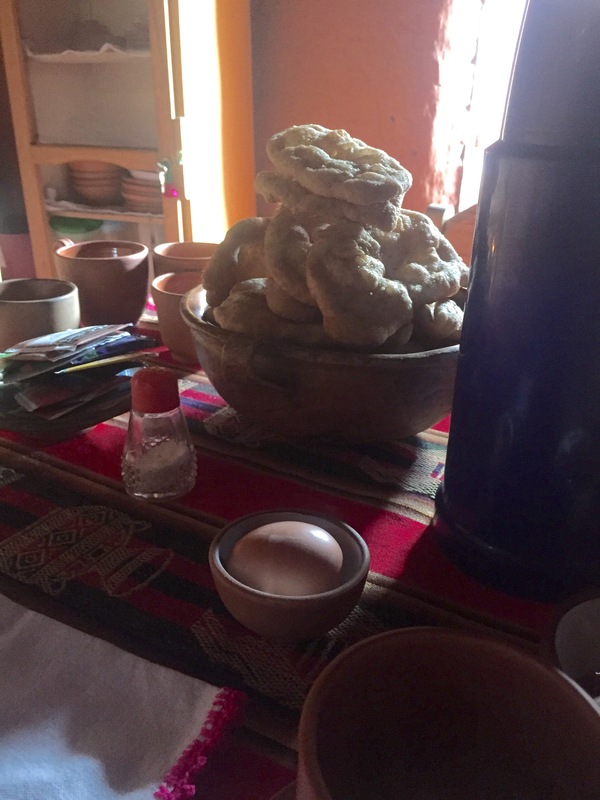 We were invited into the kitchen at 7 for dinner where we met her older sister, Hilda and her parents Francisco and Theresa. We were served semolina soup (which I didn’t particularly enjoy) and potatoes, rice and vegetables which was really yummy! 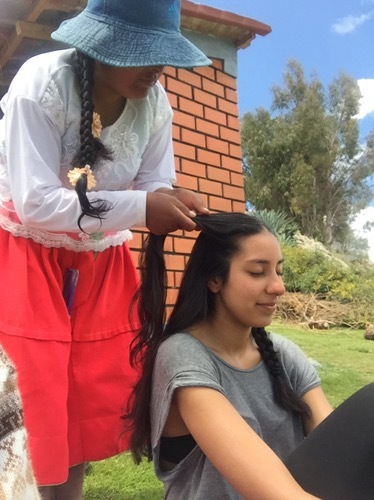 The family spoke in their local language, Aymara but Stephanie and Hilda also spoke Spanish. I did some translating for Ammun, although she understood most of which was going on and it’s easy to communicate through mime and facial expressions. After dinner we wanted to spend more time with the family and suggested that we play some card games. We thought pass/old maid and snap would go down the best considering the language barrier and we had a great time! Papa Francisco went to bed early but Mama Teresa stayed and, although she didn’t join in, she enjoyed watching the card games. After looking at the amazing stars and watching the lightening from the storm, we got an early night, wrapped up in our 6 blankets! The next day, Stephanie came and knocked for us at 7 and we helped make the bread for breakfast. She had already made the dough and we just had to stretch the balls into shape. We had it with a boiled egg, marmalade and mint tea. It was really good but I started feeling the altitude again and needed to lie down for a bit. While I was resting, Ammun went with her and fed the Bulls and the donkey and then I joined in with letting the sheep out of their pen. Next, Stephanie handed us some pick axes and we helped turn over the earth in one of their vegetable patches. It was hard work but quite satisfying to see it all done. Before another yummy lunch of quinoa soup and cheese, potatoes and vegetables, we had a lie down on the grass where we could see all the buildings on the hill and the lake. 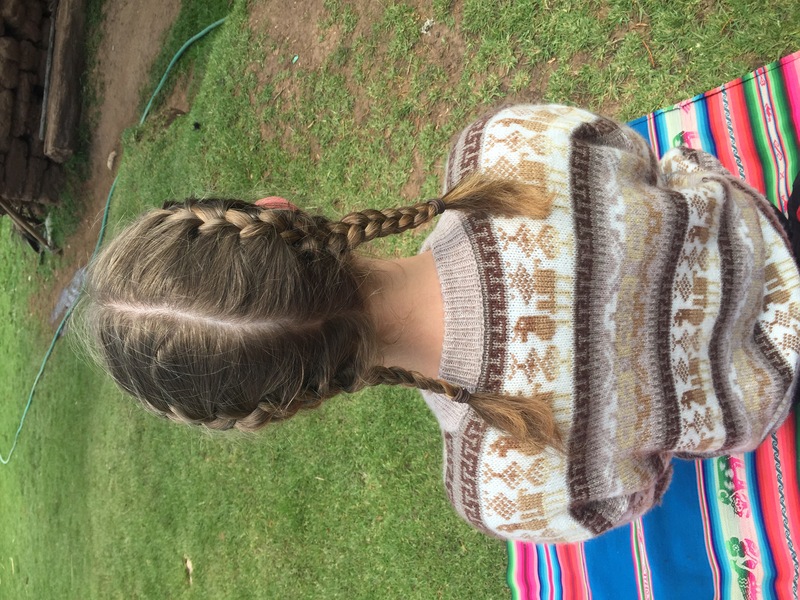 Stephanie plaited our hair in the tightest plaits I think I’ve ever had! After lunch it was time to say goodbye to our families and they walked us back down to the boat. 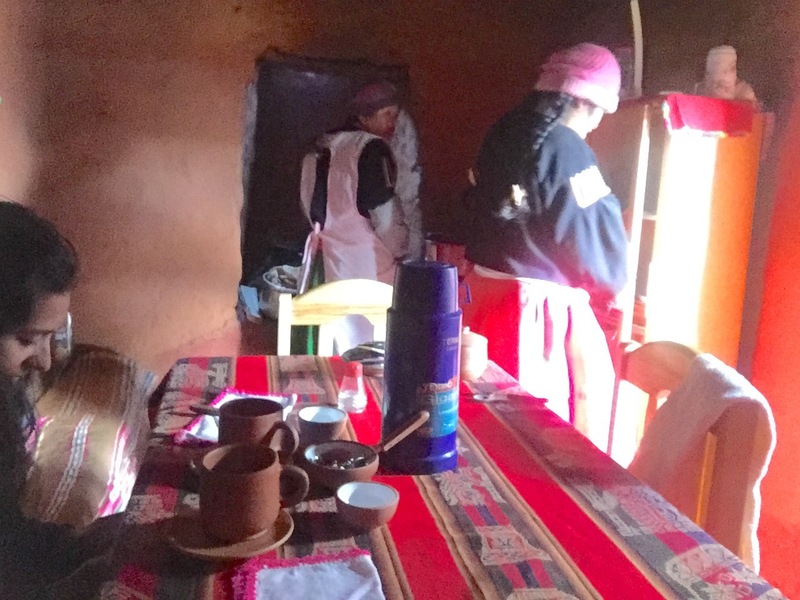 We returned to Puno in the midst of an electrical storm that was so bad that there was a power it throughout the city, flooding on every street and hail so bad that it looked like it had snowed! We returned to the same restaurant as we knew they had a pizza oven that should work without electricity but they were able to make everything except the Guinea pig which was great! 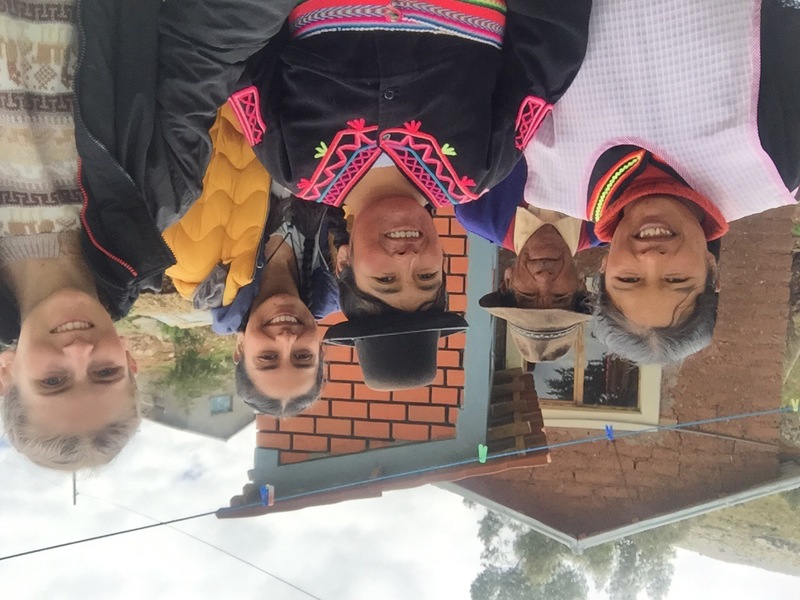 I thoroughly enjoyed these few days on Lake Titicaca and it’s been so interesting to see how others live. If anyone reading this is interested in doing the same, I did it as part of a G adventures tour but G used another company called Edgar Adventures.